The Martin Yale Intimus Mid-Sized Shredders are designed to meet the needs of any office, shredding up to 18 sheets of paper at once, including paper clips and staples, while also meeting today’s security challenges. The automatic operation starts the shredder the moment confidential documents enter the machine and stops when the job is done – hands free operation clear and simple. 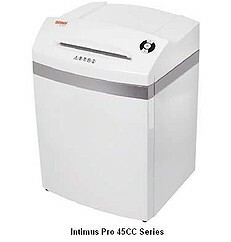 The Intimus PRO 45CC Series are multi-functional shredders that destroy paper, CDs, DVDs, floppy disks, staples, paper clips, and credit cards. With an integrated Auto-Reverse function for easy removal of jammed paper and is user friendly thanks to the i-Control function. The PRO 60CC features a 2 x 2 Cut & Collect which means that there are separate cutting blocks for digital media, Silentec for innovative sound dampening principle and EcoLogic for more energy efficiency with an 11.9 gallon capacity. The Intimus PRO 60CC and PRO 90CC share all the same great qualities as the PRO 45CC with the addition of a capacity of 15.9 gallons for the PRO 60CC, and the PRO 90CC has a capacity of 23.8 gallons. The key to the success of data shredders lies in the infeed behavior and in the geometry of the cutting shafts. Both factors are vital for high performance and for the required shred size. The cutting shafts of the Intimus PRO data shredders are integrally made of especially hardened steel. They are wear-free and can handle paper clips and staples. CDs, plastic cards and diskettes are shred with the same precision in a separate cutting unit. The use of two pairs of cutting cylinders reduces system load and guarantees long service life. If you have any questions or are interested in purchasing the Martin Yale Intimus Mid-Sized Shredders, visit us at SpiralBinding.com. We have great pricing on a full line of Mid-Sized Office Shredders. Call us at 1-800-631-3572 for more information!